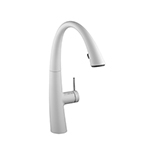 The KWC gooseneck pull out kitchen faucet is a modern and sleek addition to any kitchen. 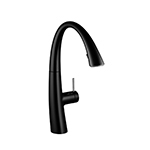 We have several kitchen faucets with pull out sprayers to choose from, and they come in black, white or stainless-steel finishes so they can perfectly complement any decor. 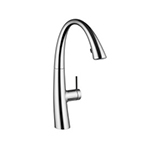 KWC plumbing fixtures are known for their quality, and the Zoe pull down faucet is no exception. It’s convenient, easy to operate and a gorgeous addition to any kitchen. Our stock ensures you'll find exactly what you're looking for, and we encourage you to stop by again because we're always updating.